Happy Monday friends! The sun has finally decided to grace us with its presence, which puts me in a great mood, especially after not seeing it for eight days. Along with the sun, this outfit is making me smile, as it's combines a couple of my favorite pieces. The first is this striped blouse. There is nothing that I love more than classic pieces that have a fun twist, and this blouse is the perfect example. I'm obsessed with the twisted front and tie sleeves which adds a cool effect to this otherwise basic classic. Not to mention that it's light weight and easy to wear, making it a perfect summer top. I paired it with my favorite AG jeans and loved the contrast of the darker denim against the lighter blue top. My other favorite piece is my new Chloé bag! Those who follow me on Snapchat (Rach480) or Instagram, know that my boys gave me my fist Chloé bag for Mother's Day. 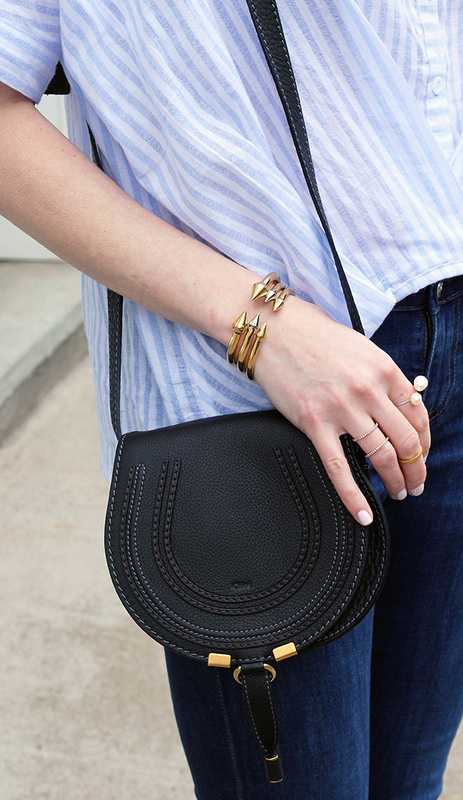 I'm obsessed with the classic look of this Marcie bag, and it's the perfect size to fit my basics whether running errands or enjoying a night out. Absolutely love this top for stylish summer outfits!! Wow, talk about the perfect gift! Love your new bag. A Chloe is my dream bag for sure. Loving the unique take on this striped shirt too. I adore you and your sense of fashion and style. This basic outfit is perfect!!! Beautiful bag!!! Love the striped shirt too! you look amazing!! love this casual look with your Chloe Bag!! This top is so interesting and unique. Like it a lot. And the bag is gorgeous! Love the edgy cool of the top! WOW!! Your top is so different and so cool!! Love the detail! Beautiful look Rachael! Love the classic look with the edgy jewelry!! The detail on that top is to die for! What a fun twist on a classic! Love how you dressed it up with the heels, well done lady! I have to agree with you. I am drawn to classic pieces with a fun twist or special detailing. They make an outfit so much more eye catching. Love that gorgeous top! Great look ! I am in love with your Chloé Bag. What a unique, beautiful shirt! Love the sleeves of this top, they are so cute! I'm totally into everything striped right now, so this top is perfect! So cute and classic! Loving that top and the cute cut! Such a gorgeous bag too! Such an interesting, cute top! I love the colors of it, especially with those shoes! Such a cool top! Love the unique detail.. and the stripes of course! It looks great paired with the jeans too! Love this look! super chic and the interesting design of the top adds some pop to it. That is a classic blouse with a twist. Love it. Gorgeous pumps too. Enjoy your new beautiful Chloe. Fantastic Mothers' day gift. What a great top and your boys have great taste to get the Chloe purse for you!